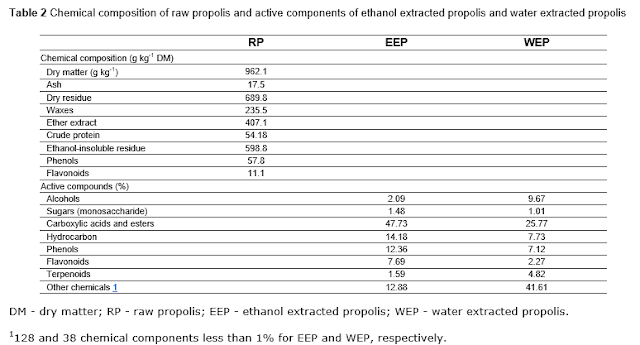 The objective of this study was to determine the effects of raw bee propolis and water or ethanol extract of propolis on growth performance, some blood parameters, and immunoglobulins in 15-20-week-old Ross-308 broiler breeders. The birds in the control were fed a diet without propolis, whereas the birds in the treatment groups were fed diets with raw propolis (RP), water (WEP), and ethanol (EEP) extract of propolis at the level of 1200, 400, and 400 ppm, respectively. Raw propolis and propolis extracts did not affect body weight gain, feed intake, feed conversion ratio, and some blood parameters, such as aspartate aminotransferase, alanine aminotransferase, total antioxidant status, triglyceride, and phosphorus. Birds fed EEP and those in control group had a lower IgA value compared with birds fed RP. Birds fed RP had higher IgM level than those of the other groups, and birds fed EEP had lower IgM level than those of control and RP-fed group. The IgY value of breeders fed EEP was higher than those of the other treatment birds, whereas that of WEP-fed birds was higher than those of control and RP treatment. The antibody levels of Anti-Newcastle disease virus and anti-infectious bursal disease virus were higher in EEP and RP-fed groups than those in the control and WEP-fed groups. The WEP decreased total oxidant status value compared with the control and RP treatments, whereas EEP and WEP increased plasma total protein and calcium contents compared with the control. The EEP increased plasma albumin content compared with RP. 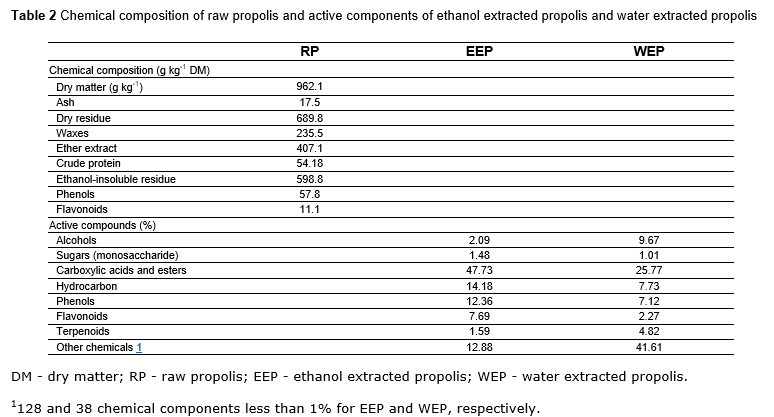 The addition of propolis extracts, especially WEP and EEP, to diet improves immunity and antioxidant activity, as well as enhances Ca absorption of broiler breeders.